Pizza night is a regular occurrence around here. I like to mix up the toppings and flavors, but the method is always the same. Pizza stones for life, right? 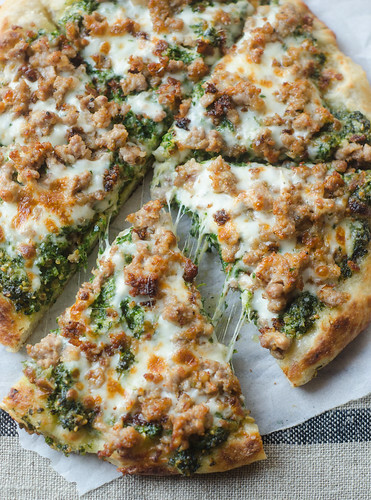 However, this kale pesto and sausage pizza in the January Cooking Light caught my eye with the flavor combination, and then the method of cooking it in a skillet piqued my interest even more. This method is super easy too - it starts on the stovetop to give you a nice crispy crust, then finishes under your broiler for maximum cheesiness. I really loved this flavor combo as well. Spicy sausage and earthy, nutty kale pesto. At first I scoffed at the low amount of cheese, but truth be told, it was plenty. 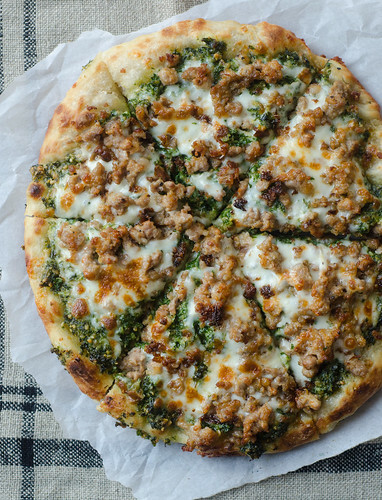 It allowed the flavors of the pesto and sausage to shine through, while still providing the stretchy, cheesy goodness that we all expect and love from pizza. Friday night is synonymous with pizza night, so if you're looking for a fun and different take on pizza, give this one a try! Happy weekend! Heat a 10-inch skillet (preferably cast iron) over medium high heat. Cook the sausage, crumbing as you go, for 3-4 minutes, or until it's browned. Remove from the pan. Add the kale, 2 tablespoons of water, and the sugar. Cover and cook for 2 minutes, or until the kale wilts. Remove the kale from the pan and place on a lint-free kitchen towel or double layer of paper towels. Squeeze to remove as much moisture as you can. Remove the skillet from heat. Pulse the nuts, red pepper flakes, and garlic in a food processor until finely chopped. Add the kale; pulse until finely chopped again. Add 2 tablespoons of the oil and process until it becomes a paste, adding 1-2 tablespoons of water if it's too thick. Stir in the parmesan cheese. Heat the remaining tablespoon of olive oil in the skillet over medium-high heat. Roll the dough into a 10 1/2 inch circle and transfer to the skillet. Press the dough light up the sides of the pan if you can. Top the dough evenly with the pesto, followed by the sausage and mozzarella. Cook 2 minutes, then transfer the pan to the oven and broil 2 to 3 minutes, or until the cheese is melted. Allow to cool 5 to 10 minutes, cut into 8 pieces, and serve.